A critically-endangered corroboree frog getting tested for chytridiomycosis. The origin of the world’s deadliest amphibian disease has remained elusive for decades, but not anymore. New research has pinned down where the infamous fungal plague “Bd” got its start and how it began infiltrating habitats across the globe. Unsurprisingly, humans are largely responsible for its spread. Batrachochytrium dendrobatidis is a fungal pathogen that infects amphibians—like frogs and salamanders—causing a disease called chytridiomycosis. The aggressive infection has reached just about every corner of the globe graced by a frog’s song, and infected roughly 30 percent of all known amphibian species. Repeated outbreaks of the disease are currently ravaging populations to the point where “Bd” has become an existential threat to the survival of hundreds of species. Despite Bd being an amphibian menace since the 1970s, up until now, it wasn’t clear how the deadly strains got out into the world, or when that happened. Previously, scientists estimated the disease could have become globally distributed anywhere from 100 years ago to as far back at 26,000 years ago. The source of Bd had been suggested as everywhere from Africa to North America to East Asia. The new study, published yesterday in the journal Science, irons out much of this uncertainty by determining the interrelatedness of existing strains and their common ancestry. It makes the case that everything started no more than a century or so ago on the Korean Peninsula. 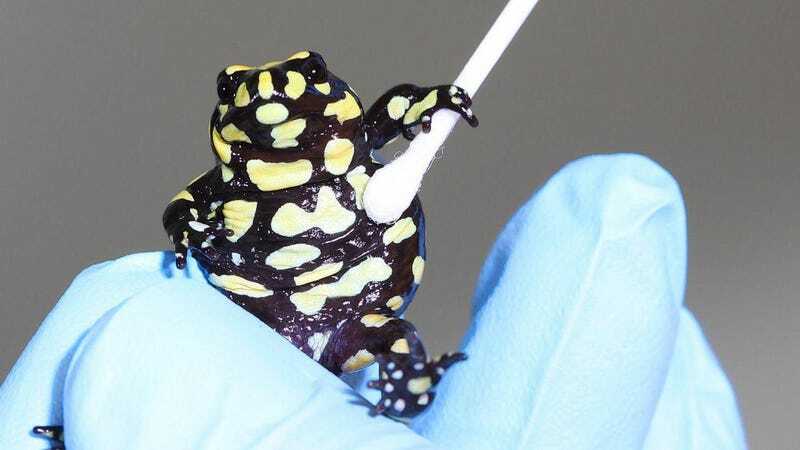 The international team of researchers—led by scientists at the Imperial College London—sequenced the genomes of about two hundred Bd cultures collected from infected amphibians from across every continent. The Bd samples ended up clustering into several main lineages, which were already known. But a previously unknown, hyper-diverse lineage also turned up, centered on samples that came out of the Korean Peninsula. Such high genetic diversity at this one spot suggests that the Korean Peninsula population is probably the ancestral population for all strains. To figure out when the super virulent, global strain (BdGPL) came into existence, the researchers turned to a method that uses estimates of a gene’s mutation rate to extrapolate out the age of a lineage. They found that the lineage came about sometime in the early 20th century. Notably, during that same period, the world experienced an upswing in the international commercial trade of amphibians. Given this very close overlap in timing, it’s likely the blame for the global pandemic sits squarely on humanity’s shoulders. The results also present a sobering status report on the continued failure of international biosecurity measures to keep Bd contained. The researchers found that all major strains of Bd turned up in amphibians involved in international commercial trade (for food, exotic pets, etc), illustrating that the amphibian trade is still very much shuttling around the fungus between continents. No wonder some scientists have called for banning amphibian imports entirely. Finally, the study provides information that will be ultimately be useful in understanding and anticipating the spread of the disease. While the most virulent form of Bd is globally-distributed, there are other lineages that seem restricted to certain regions. The presence of these strains might help explain why certain species fare better than others when faced with infection. These endemic strains may also be capable of causing their own outbreaks, and therefore require more study and attention. Their potential for spread highlights the extreme importance of strict biosecurity measures going forward. Jake Buehler is a science writer living on Washington’s Olympic Peninsula with an adoration for the Tree of Life’s weird, wild, and unsung—follow him on Twitteror at his blog.